Being a jet-setting copywriter has plenty of lifestyle advantages and one of the best is that I can work from anywhere on earth, provided there’s functional WiFi and a quiet place to plonk down my laptop. As long as deadlines are met and clients are happy, my office can be an alpine hideaway in Austria, a coastal town in Croatia, a Vancouver café, or a lakeside cabin in the Chilean Andes—my clients don’t really care. I’ve been living this way since 2013, writing everything from product descriptions and insurance articles to online brochures, video scripts, and non-fiction e-books. I normally set myself up in an affordable Airbnb apartment in a quiet, local neighborhood and then juggle online writing work and sightseeing. If you stay a month or longer, many Airbnb places offer substantial discounts—I rarely end up paying more than $35 a night anywhere in the world. My favorite writing spot on earth is probably the southern coast of Portugal: the spectacular Algarve. A typical workday starts with a breakfast of locally sourced fresh fruit, yogurt, eggs, and bread, followed by a few hours of writing and then a trip to the beach to cool off. Portugal’s southern coast is the warmest, sunniest place you’ll find in all of Western Europe—and the cheapest. Portugal even beats Spain on price for most everyday living expenses. In Carvoeira, a small seaside Algarve village, I paid less than $20 for some of the best seafood dinners I’ve ever had, and that includes dessert. Insider tip: don’t miss the delicious grilled octopus, a local specialty. And don’t forget, Portugal has its own versions of paella too and they’re all scrumptious. Pristine golden-sand beaches dot the entire Algarve coast. Excellent local beer or wine costs less than $3 a glass and the fresh produce and seafood is super-cheap if you shop at local farmers’ markets instead of visiting supermarkets. One morning, I picked up a shopping bag chock-full of giant avocados, strawberries, peaches, and assorted vegetables for about $7. And I don’t think I’ve ever paid more than $10 for lunch anywhere in the country; the trick here is to avoid the touristy hot spots in the main plazas. Perhaps the nicest thing about Portugal is the friendly people, who go out of their way to make you feel welcome. 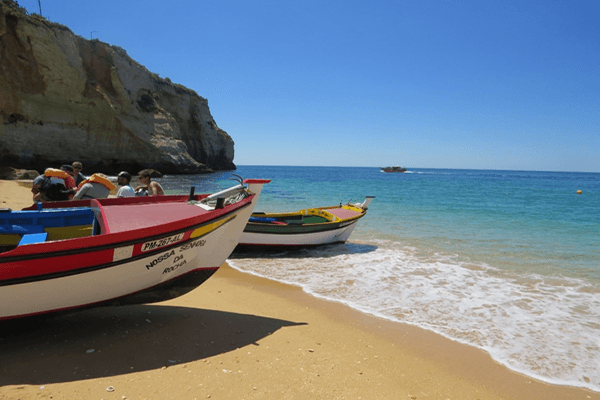 English is widely spoken in the Algarve region due to the high numbers of British tourists that flock there in the summer, so communication isn’t a problem. Portugal’s infrastructure is world-class too, and it’s one of the safest countries anywhere, ranked fourth in the world on the Global Peace Index. 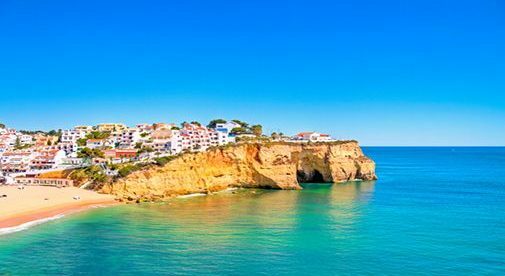 All of Portugal is beautiful but what sets the Algarve apart is its stunning coastline: a sun-soaked stretch of pristine, golden-sand beaches separated by cliffs and sea caves. Nothing says “Algarve living” more than sipping a glass of wine from the outside deck of a cliff-top café at sunset as the yachts slowly glide past. When I’m working, I usually look for a shaded spot in a friendly café (with WiFi) and tap away, glancing occasionally out the window at the Algarve’s amazing color show: white cliff-top buildings, golden sand, tan headlands, and the deep blue of the Atlantic. Sometimes, on a good day, I can even manage to get a little work done.